Within a compact space, choosing the right pieces of furniture is crucial in order to feel relaxed and comfortable. Maximize every square foot of your room with Bestar's Small Space units! This Storage Tower set includes one 20-inch Tower, one 19.5-inch Add-on Tower and two 9.5-inch Add-on Towers. Each tower features 2 fixed and 3 adjustable shelves. The top and the bottom shelves of each tower are fixed. The doors can be installed between 2 of the 3 adjustable shelves for a unique design. If the 20-inch Storage Tower and the 19.5-inch Add-on Storage Tower are connected together, the doors can't be installed at the same height. Assembly Required. This set includes one 37-inch Lift-Top Storage Coffee Table and one 53.5-inch TV Stand. 37-inch Lift-Top Storage Coffee Table: 37.2 inch W x 26.5 inch D x 15.1 inch H. Durable commercial grade top surface with melamine finish that resists scratches, stains and burns. Thanks to the Lift-top mechanism, you can quickly and quietly adjust the top surface from standard (15 inch) to elevated (23 inch) position. Lift-top functionality allows dining and working while enjoying the comfort of your sofa. Large storage compartment under the table top to keep you organized. The 2 open compartments are accessible on both sides of the table. 53.5-inch TV Stand: 53.5 inch W x 14.5 inch D x 15.1 inch H. Durable commercial grade top surface with melamine finish that resists scratches, stains and burns. 3 open compartments to keep you organized. 1 closed compartment with 1 adjustable shelf and 2 grommets for efficient wire management. Assembly Required. Jasper Audio Tower from Nexera is offered in a rich Truffle finish with a simple and contemporary design. This audio tower offers convenient multi-purpose storage and is well suited for electronic devices as it allows for easy cable management and optimal air flow. Attractive and versatile, the Double Multimedia Storage Tower is a practical storage solution for your media collection. Its shelves, separated by a central divider, boast room for over 300 CDs. Each shelf is fully adjustable, meaning you're free to customize according to your collection's needs. Fill and sort through your collection with ease, thanks to the horizontal storage. Attractive and functional, this tower is perfect for the casual collector. 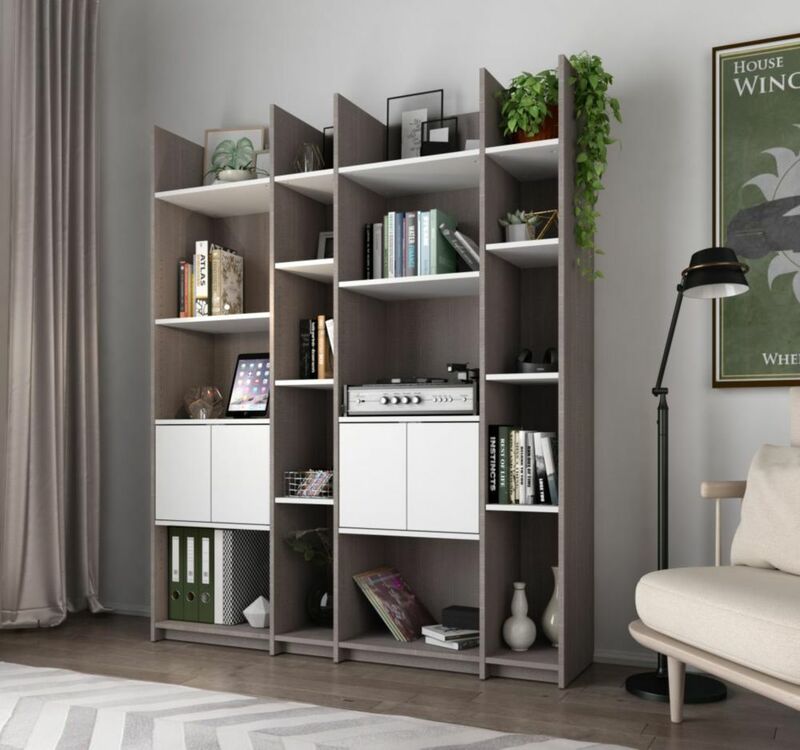 Small Space Storage Wall Unit - Bark Gray & White Within a compact space, choosing the right pieces of furniture is crucial in order to feel relaxed and comfortable. Maximize every square foot of your room with Bestar's Small Space units! This Storage Tower set includes one 20-inch Tower, one 19.5-inch Add-on Tower and two 9.5-inch Add-on Towers. Each tower features 2 fixed and 3 adjustable shelves. The top and the bottom shelves of each tower are fixed. The doors can be installed between 2 of the 3 adjustable shelves for a unique design. If the 20-inch Storage Tower and the 19.5-inch Add-on Storage Tower are connected together, the doors can't be installed at the same height. Assembly Required.